The solution in this post is useful regardless of regulatory requirements. 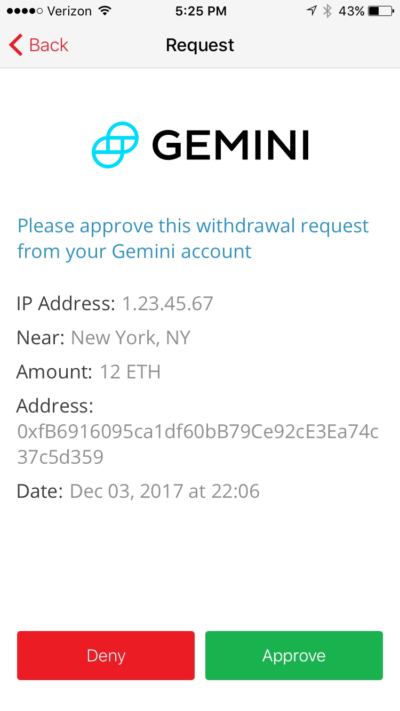 For example, Gemini uses push authorizations to validate cryptocurrency withdrawals. Start by downloading or cloning the starter application from Github. If you haven't already, now is the time to sign up for Twilio and create an Authy Application. Navigate to the Twilio Console and grab your Authy App API Key under Settings. Next, install the necessary dependencies. Now we're ready to run and test our starter application. Navigate to http://127.0.0.1:5000/auth/register and register yourself as a new user with your real phone number. The application already has phone verification with the Twilio Verify API, which allows us to use the user's trusted phone number for subsequent authorizations. 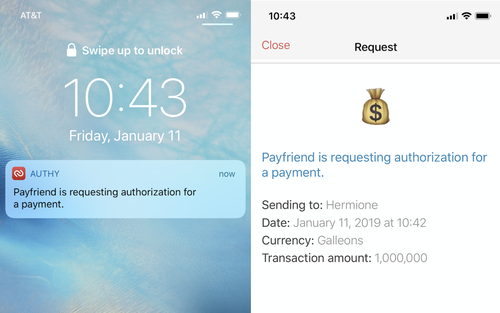 Phone verification is an important part of PSD2 compliance; we need to trust the device before we can start using it for payment authorizations. What if we wanted additional safeguards to make sure I approved sending that money to Neville? When a new user signs up for our website we store them in the database and register the user with Authy. This code is already in the starter project and you can learn more about that process in the Authy API documentation. Once we register the user with Authy we get the user's Authy ID from the response. This is very important — it's how we will verify the identity of our user with Authy and send subsequent authorizations from our application. Sending a one-time token in a text message sent with the Authy API. When a user attempts to "Send a Payment" on our website, we will ask them for an additional authorization. Let's take a look at push authorization first. When our user sends a payment we immediately attempt to verify their identity with a push authorization. We can fall back gracefully if they don't have a smartphone with the Authy app, but we don't know until we try. Details will show up in the app. Hidden details can also be included for tracking information about the request (like origin IP address) that you may not need or want to display in the app. Let's write the code for sending a push authorization. Head over to payfriend/utils.py and add the following function. This function constructs our push authorization request. We add necessary details about the request like the transaction amount and the payee. We also define the logo that will show up in the request. If the request is successful, resp.ok() will return True and we can grab the authorization uuid from the response. Otherwise we'll return the relevant errors. Next, head over to payfriend/payment.py and add the code to call our new function. In def send() we only want to add the Payment to the database once we have sent the push authorization. To do that, we'll add a conditional statement after we try to send the push authorization. Replace lines 76-79 (starting with payment =) in the starter project with the highlighted code below. Make sure you have the Authy app installed on your phone and that you're registered for Authy with the same phone number that you used to register for Payfriend. Restart the Flask application and send a payment. We're not updating the status yet but this time you'll get an authorization request in the Authy app and see a 'pending' status attached to that new payment ID. In order for our app to know what the user did after we sent the authorization request, we need to register a callback endpoint with Authy. In payment.py add a new route for the callback. Here we look up the payment using the uuid sent with the Authy POST request. We want to handle our authorization asynchronously so the user doesn't even know it's happening. First, we hijack the payment form submit and pass the data to our controller using Ajax. If we expect a push authorization response, we then begin polling /payment/status every 3 seconds until we see the request was either approved or denied. Our callback will update /payment/status so we will know when an authorization has been approved or denied. In auth.js update the sendPayment function to check for the payment authorization status before redirecting the user. Head back to Authy Console and update your application's Push Authentication callback URL with /payments/callback appended. Leave ngrok running in the background and try sending a new payment. Now when you approve or deny the request your application will update the payment status and you can see it reflected in your list of payments. Now let's see how to handle the case where a user doesn't have the Authy app installed. There are reasons that you could include SMS as a verification option: like being able to reach users without smartphones and onboard users seamlessly (no app install required). In utils.py add the code to send and validate an authorization token via SMS. One important feature we're taking advantage of here is the action and action_message parameters. The action will tie the SMS authorization to the specific transaction, a requirement for PSD2. The action message will add important details to the SMS message body about the payee and amount of the transaction, other requirements for PSD2 and a helpful message to the user regardless of regulation. Note that you must include the same action parameter when sending and checking the token. We're using the payment_id for that. Finally we can take advantage of the existing token verification route we used for phone verification in auth.py with a few small changes. Then update the /verify route to check based on the type of verification. Right now this route only handles phone verification on signup before we've created the Authy user. Therefore we can assume that if the global user has an Authy ID then we can check the SMS authorization instead of the phone verification. Generic endpoint to verify a code entered by the user. Nice! Now you have a PSD2 compliant application with two different options for authorization. The full code is available on my Github. Take a look at this diff to compare the finished solution with the starter solution. For more details on PSD2 compliance, you can read our explainer on dynamic linking. Check out more things you can do with Authy in the API documentation. Monitor your Twilio applications with SMS alerts using the Twilio App Monitor, Python and webhooks.